Specifications are Subbject to change without notice. Stand wire and point wire I2/l2 SWG. VlZ.2.5-2.8/2.5-2.8 M.M. DIAMETER. H.B. fully hot dipped galvanized wire with under 30 kg. F/MM to 55 kg. F/MM. 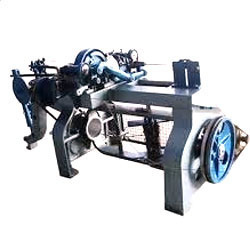 Barbed Wire Machine is designed to produce double (or single)stranded barbed steel wire, thermo-plated with zinc. The machine is of horizontal design, consisting of two parts, assembled together at the middle. It is safe and reliable in operation, capable of turning out high quality products with consistency.